What would the local reaction be if there was a second European referendum? NOBODY knows, but Dovorians are practical, savvy people. With neighbours who work on the Port or with Border Force, we are not intolerant or totalitarian. So, we will continue to discuss what is best for us locally and nationally with respect for the different views of our neighbours and friends. We prefer the truth that comes from professionals to the deceptions of grandstanding brexiteer MPs with trust funds moved recently to the EU27. The media select committee of UK parliament and the Electoral Commission have found evidence of Leave leaders cheating in 2016. 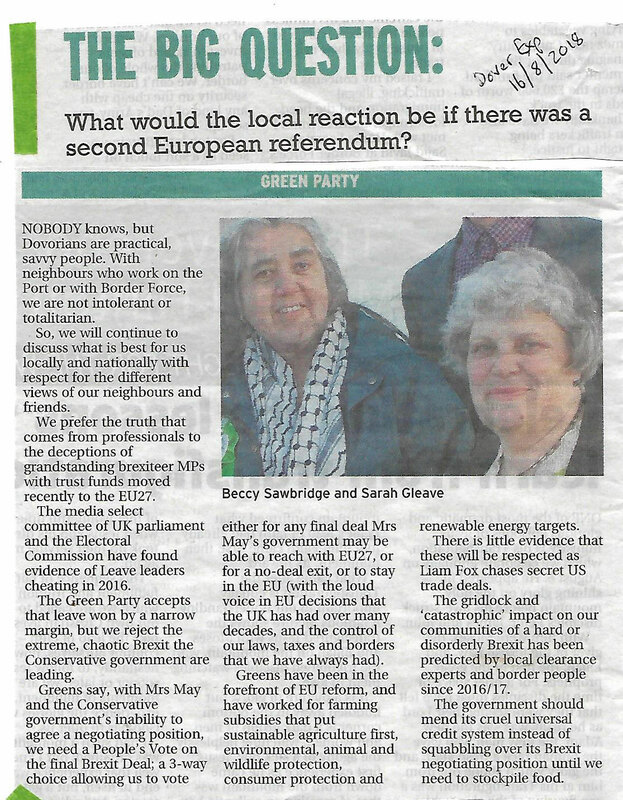 The Green Party accepts that leave won by a narrow margin, but we reject the extreme, chaotic Brexit the Conservative government are leading. or to stay in the EU (with the loud voice in EU decisions that the UK has had over many decades, and the control of our laws, taxes and borders that we have always had). There is little evidence that these will be respected as Liam Fox chases secret US trade deals. The gridlock and ‘catastrophic’ impact on our communities of a hard or disorderly Brexit has been predicted by local clearance experts and border people since 2016/17. The government should mend its cruel universal credit system instead of squabbling over its Brexit negotiating position until we need to stockpile food. This entry was posted in Brexit on August 16, 2018 by Sarah.